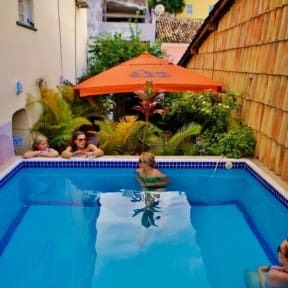 Hostel Galeria 13 v Salvador, Brazílie: Zarezervujte nyní! No refund on the booking deposit or booking fee for a cancellation, no show or reduction in numbers. if it is a group of 3 or more people and between january 1 until september 15th and from december 15th until the 31st In order to secure your booking, Galeria 13 requires a deposit of 50% of your total stay. Further instructions will be sent to the e-mail address you provided upon your HostelWorld booking. We are located in Salvador's Historic and Cultural Centre, and a UNESCO World Heritage Site, the Pelourinho. The Galeria 13 experience consists of two colonial houses separated by a 30-second walk: one for travelers who like meeting fellow travelers, and one for travelers seeking a more quiet stay. Let us know if you have a preference so we can try and accommodate you accordingly. 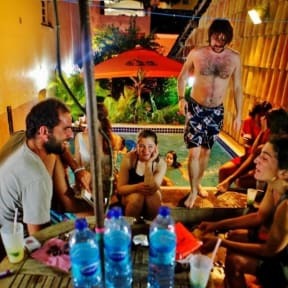 Right in our first year we were voted Best Hostel in Brazil by HostelWorld members. You can also find us in Lonely Planet's finicky Our Pick, along with some rather flattering words from the traveler's holy book. No wonder. By staying with us you get tons of daily freebies, including the obscenely big breakfast until midday, caipirinha Happy Hour, Brazilian film sessions, and of course, discounts in TripAdvisor's top rated Bar Zulu. For the full list, please scroll down to Facilities. Leaving late no problem you can hang around the hostel free of charge until 2300 after that its only fair you pay another night! We offer our great breakfast until 1200, but please note we do not have a customer kitchen. Woof woof! Take note: we are a dog-friendly hostel; if you have an allergy or are not a fan of the four-legged friends, Galeria 13 might not be for you! dogs, please be aware we have a dogie . change please do email the hostel.